How do you do a book signing when you have an e-book? Answer below. 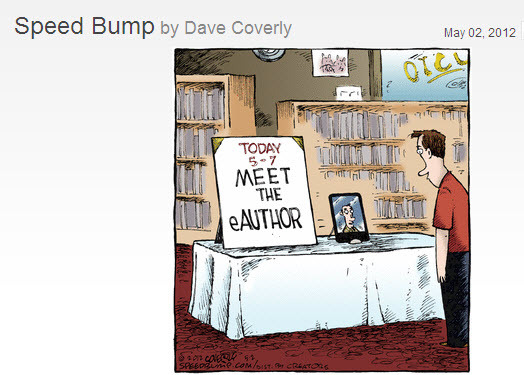 I saw this Speed Bump comic strip, and while it made me laugh, I also thought it captured the problem many authors have pondered when they think about book signings in an era of growing e-books sales. How exactly do you do a book signing in the days of digital publishing? Well, I think there is an answer and you can see how it works this Thursday, May 10th from 2:30-3:30 EST. It is called Behind the Story: A Virtual Book Signing. Registration is limited to the first 200 people and you can sign up by clicking on this link. Harvey Gould and his book, A Fierce Local, which is a memoir that offers a vivid picture of what it’s like to travel and live in Ireland. Ted Simon and his book, A Toxic Assault, which draws eerie connections between race relations in the American South and environmental crimes. Harvey Burgess and his mystery novel, Kiss Her Goodbye, which introduces readers to the character Houston Cash, an ex cop turned private investigator. Stuart Maloney and his book, 26, in which he takes readers on an in-depth tour of his life with cerebral palsy. Don’t miss out on this unique opportunity to connect authors with readers. I think you will find it quite enjoyable. → Wow! Booktango lets you keep full sale price of your e-book.